"The Best trades come after the strong moves. They have a certainty based on quantum physical laws. : The profitable way to Use Snitch. "The Best trades come after the strong moves. They have a certainty based on quantum physical laws. The profitable way to Use Snitch. After a few years of selling Snitch apps I realized one thing. My users hardly reazlise how to use this app properly. They are reading signals as if they were cues to open trades when they are not. 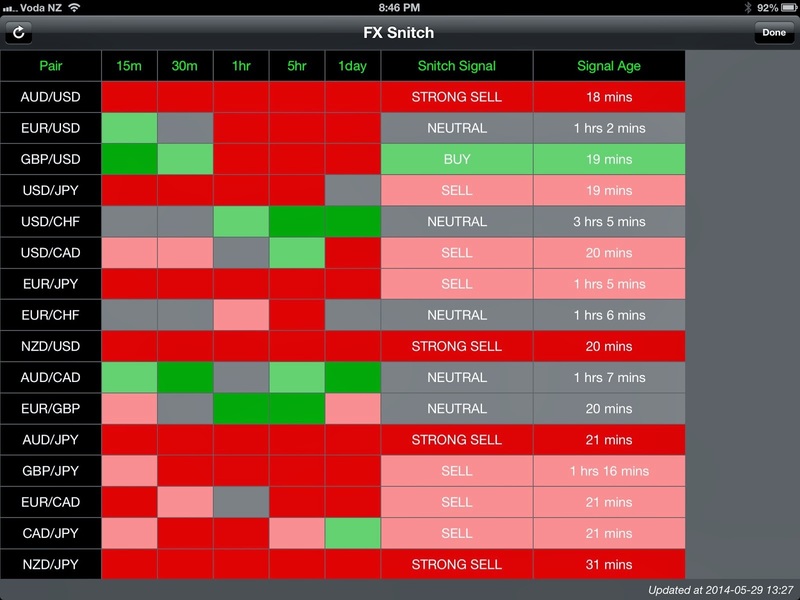 This application will tell you when to start trading against signals. In an attempt to rectify the ignorance and to help people understand so that I am not the only one making money here. Look at your Snitch Signal Ages. Find the ones with strong signals . Signal AGES of 4-5 hour s or more. Now check your Charts to confirm Price movements. Based on Strong Buy or Strong sell signals , position into the opposite side of the strong and older aged signals. Do not be be fooled into just following signals the market gives. Allow the market to create its own drama then be on the side of comeback each time. Use trailing stops which protect your capital . Set them at a rate which reflects your needs without getting yourself stopped out to easily catch some kind of consistant profit as your trade improves. Once your trails kick in allow the positions to manage themselves. Set and forget. Screen shots to follow to help explain more clearly. Now the other side of the trade which is a little more advanced. When you see say a fresh buy or sell you can check your chart. If it updates after 30m into a neutral signal on snitch , then check your chart again it may well mean what you think it means "time to sell" Taker the GBP, JPY here. A normal light colored buy signal has gone to neutral and the chart confirms a good place to perhaps take a sell position. So as you can see this is the first time I have properly elucidated the now tried and tested method for making most effective profits from this app. Personally I mostly stick to deep retracement of older "strong" signals. I use a measured stop with an Ea that cuts the trade off at X amount which for example right now I am selling GBP/JPY .3vol with robot cutting off position at 28$sl. To enter this position I took my cue from the app then went to the charts. It looked good to trade against the Strong and old signal on the chart too. So I switched to the 5m chart then looked for the rough consolidation channel, and as the price bounced to test the top of that current price channel I entered market with a sell. This will be updated with more info and screen shots to help alleviate peoples perceived misunderstandings about how to make money from Snitch . Sell into STRONG BUY signals 4-5hours or older, after checking charts! Buy into STRONG SELL signals 4-5 hours and older. When you know your direction switch to 5 minute charts to wait for price action to get to the top or bottom of the current consolidation channel.. Ie if you want to buy - the bottom, If you want to sell then the top of the current price action channel. Is your broker screwing you over contact me right away. I can help you! Or for any money making questions use the form below.